“When I wrote [Ricki and the Flash] I was thinking micro-indie, honestly. I just wrote it on spec and I did not think there would be any interest in it. I still believe the only reason this movie got made was because Meryl Streep attached herself to it. The fact that this is [my] biggest release in terms of screens—it’s scary. P.S. So how did Cody get Streep interested in the script? P.P.S. If you’re new to this blog you may not beware that I started this blog in January 2008 just days after seeing Juno and learning that Diablo Cody went to the University of Iowa and wrote the Juno script while living in the suburbs of Minneapolis. At the time I was living in Cedar Falls, Iowa (between Iowa City and the Twin Cities) and decided that I could come at screenwriting and filmmaking from a different perspective. In the post Juno Has Another Baby (Emmy) I wrote about how Cody and Juno helped pave the wave for me to earn a Regional Emmy—in Minneapolis to boot. Today is the sixth anniversary of Screenwriting from Iowa…and Other Unlikely Places, and I’m pleased to announce my loose and distant connection to a recent (and controversial) Oscar nomination. In fact, Deadline called it the “Academy’s Most Obscure Nominee—Maybe EVER.” Since one of the inspirations for starting this blog was the movie Juno, let me start there. When Juno MacGuff (Ellen Page) was 17 she got pregnant. 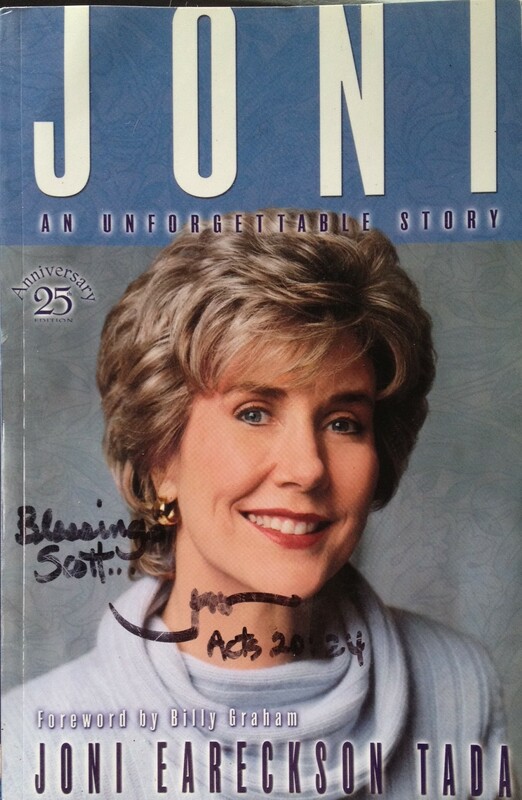 When Joni Eareckson was 17 she broke her neck. The movie character Juno gave her baby up for adoption and went back to singing indie songs. The real life person Joni became a quadriplegic and went back to singing gospel hymns. Screenwriter Diablo Cody walked away with an Oscar for writing Juno. Joni spent the rest of her life in a wheelchair—but also recorded a song that’s just been nominated for an Oscar. The now 64-year-old Joni also become a speaker, author of 50 books, married Ken Tada, and for the past 35 years has provided a global outreach to people with disabilities—including an organization that restores 10,000 wheelchairs per year and ships them to people in need around the world. If you like heroic underdog stories then you’ll enjoy Joni’s. The Hollywood Reporter says the Oscar nominated song she sings (Alone Yet Not Alone) caused a “mini-controversy.” The Week called the nominee “shady” and a “genuine head-scratcher.” You can read those links, but what’s speculated is the song (music by Bruce Broughton and lyrics by Dennis Spiegel—the two who actually got the nomination) benefited from a little Hollywood back scratching. Hollywood has been called the world’s biggest high school and at this year’s Academy Awards Alone Yet Not Alone is not sitting at the cool kids table. It’s the kid in the wheelchair sitting alone in the cafeteria. And I hate to throw out the C word here, but adding to the controversy is the song (which beat out songs by Coldplay, Taylor Swift, Celine Dion and other heavyweights) is from a little seen Christian film shot in the Ohio Valley. But keep in mind there are four Biblical films coming out this year including Russell Crowe as Noah and the February release of Son of God —and even the book that’s the basis for the Angelina Jolie directed Unbroken (scheduled for a December release) has a Christian theme. Studios are concerned about every Christian with ten dollars in their pocket and just the Academy nominating Alone Yet Not Alone (for whatever reason) I imagine is seen as an olive branch by many Christians. That olive branch didn’t hurt a little Mel Gibson film a decade ago. Several years ago when I was based in Cedar Falls, Iowa I provided camerawork for an episode of a TV program that Joni and Friends produced. (Couldn’t find that program online, but Wheels for a Kid’s World gives you a solid glimpse into Joni’s work and world.) I also produced a video of Joni talking at the Minneapolis Convention Center and remember it well because she quoted a classic Frank Darabont script and movie. While I did talk with Joni it’s doubtful she’d remember me, but I remember her well. And I got a signed book out of the deal. Because Joni can’t use her arms she signs books with a pen in her mouth. (And singing is no simple task either for Joni. According to The Hollywood Reporter, “Her lung capacity is just 51 percent of what it ought to be — so weak, in fact, that her husband needed to push on her diaphragm while she recorded the Oscar-nominated song to give her enough breath to hit the high notes.”) She’s an amazing woman and I’m thrilled to see her in the spotlight. And the best thing about a little Oscar controversy is it puts the spotlight on the global work she’s done and continues to do for people and their families dealing with disabilities. You know the old cliché , “Hollywood couldn’t have written a better story”—but I’m glad they added a chapter to Joni’s story. That book, Joni, An Unforgettable Story, is an updated version of the book she wrote that became the feature film Joni (1979) written and directed by James F. Collier and stars Joni herself. No additional song will be added. One good thing that came out of this Oscar controversy is it shed a little light on the work Joni is doing. P.S. When I lived in Burbank, California back in the ’80s I would sometimes get calls to my house asking if I was “the editor Scott Smith.” At the time I was a 16mm operator/editor, but I knew who they were really looking for— M. Scott Smith. Smith at that point had edited To Live and Die in L.A. and Some Kind of Wonderful. Other big projects he’s edited are The Crow and Ladder 49 starring John Travolta and Joaquin Phoenix. Turns out he’s the editor on Alone Yet Not Alone. It always seems to come back to Juno. Yesterday I came across the The Black List Annual Report for 2013 and it’s fun to look at just because it’s so well designed by Glen Charbonneau. I also learned that the first script on The Black List to win an Oscar was Diablo Cody’s Juno. The same movie that inspired the launching of this blog because it was written by an outsider. Cody was Chicago born and raised, received her college education in Iowa, and lived and worked in Minneapolis when her writing on the side got the attention of a Hollywood insider. But beyond the design and glance at the history of launching the first Black List in 2006 the report also gives a sweeping overview of the work they are doing. If you are unfamiliar with The Black List check out The Wall Street Journal article, For Budding Screenwriters, a Way Past the Studio Gates. Franklin Leonard’s had an interesting journey on his way to being the founder of The Black List; Raised in small town Georgia, degree from Harvard, analyst at McKinsey in New York, agent assistant at CAA, and creative executive at Will Smith’s company is Los Angeles. The Black List has morphed and grown over the years and now includes Scott Myers’ Go Into The Story as its official blog and a forums section, The Black Board, with Shaula Evans as the Keymaster. I see The Black List as a place that celebrates talent, fosters community, and is doing its part in providing a pathway for screenwriters and producers to connect. And while the bulk of the screenwriters connected with The Black List are in the Los Angeles area it’s also nice to see that they are providing a door to people in unlikely places all over the world. P.P.S. Going back to a quote by CodyI first read in ’08, “Just put your stuff out there and see what happens,” I get a kick that since its inception this blog has been read in more than 85% of the countries , regions, and dependent areas of the world, including Burndi, Macau, Suriname, and Yemen. 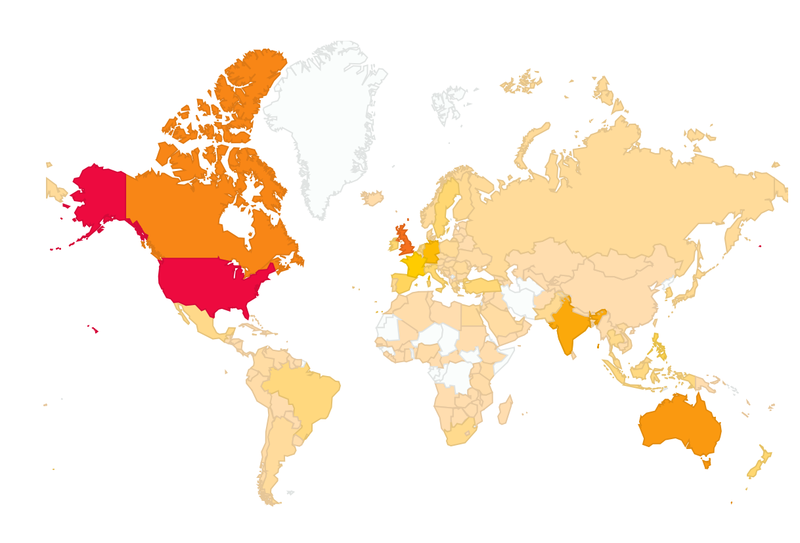 Thanks for reading wherever you are in the world and best wishes on your writing finding an audience. At the same time don’t get caught up in writing the great script. Rather focus on what WME Story Editor Christopher Lockhart calls The Right Script. Perhaps think in terms of a special pumpkin. And here’s a great pumpkin bonus video.